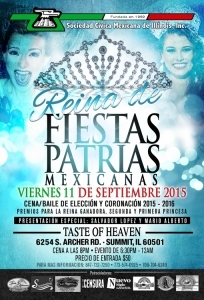 The Mexican Civic Society of Illinois will be hosting a 2-day registration and scouting event for its 2015-16 organization Queen. The scouting event will take place Friday, Aug. 28th from 5p.m., to 9p.m., and Saturday from 11a.m., to 3p.m., at Lobo De Mar Restaurant located at 5503 W. Cermak Road, Cicero, IL. Contestants must be Mexican or of Mexican descent between the ages of 16 to 25 to qualify as a candidate to be Queen of the Mexican Civic Society. The presentation of the candidates will be held on September 11th at Taste of Heaven Banquets, 6254 S. Archer Road, Summit, IL.